Hydrangeas have long held the eyes of gardeners and landscapers for their bigger-than-life ornamental appeal. This horticulturist planted two hydrangeas in the landscape within a few months of buying a house. Hydrangeas have what most horticulturists call multi-season appeal and if you are a gardener who has experienced fading daffodil and tulip foliage, or the yellowing foliage of daylilies at the end of the season then you know what I am talking about. This growing season, I challenge homeowners to try their hand at growing one of the four beautiful hydrangea species that populates central Illinois gardens. Hydrangea paniculata, also known as panicled hydrangeas, includes favorites from the industry Limelight, Pinky Winky, Quick fire, and Tardiva. These are some of the most winter-hardy hydrangea, and they are also tolerant of urban conditions like pollution. These shrubs grow six to ten feet high depending on cultivar, and bloom early to mid-summer. They bloom on new wood and should be pruned in late winter or early spring. Horticulturist Sandy Mason suggests cutting them all the way to the ground every few years. Larger flower panicles can be produced by thinning the plant to 5-10 primary canes. Limelight is known for its copious amount of flowers. The foliage turns different shades of red during the fall. Pinky Winky blooms white that turns pink with age creating a two-tone effect. The flower display is extremely impressive because the strong stems keep the flowers upright, stealing the show. Quick fire produces smaller, less full, but super prolific white flowers that turn reddish purple, on a plant that is more compact. 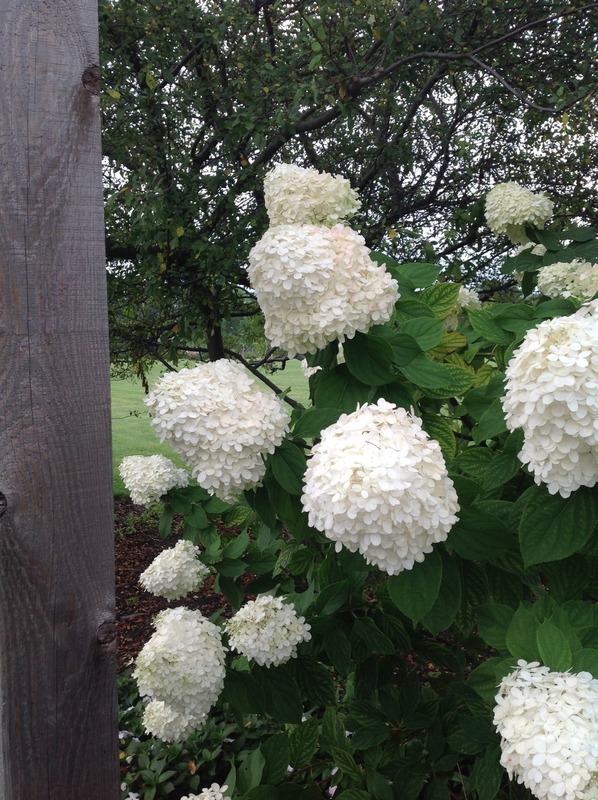 This plant tends to bloom a month earlier than other panicled hydrangeas. 'Tardiva' grow up to ten feet tall, blooming in the middle of summer and have a looser panicled flower than the others on the list. The bloom goes from white to purplish pink with age. Leaves may turn yellowish or have a tinge of purple during the winter months. Hydrangea quercifolia, also known as oak leaf hydrangea, is one of my all-time favorite shrubs. It grows about six feet tall and six feet wide in a "roundy moundy" shape. The shrub blooms large cone-shaped blooms that add color starting in May. 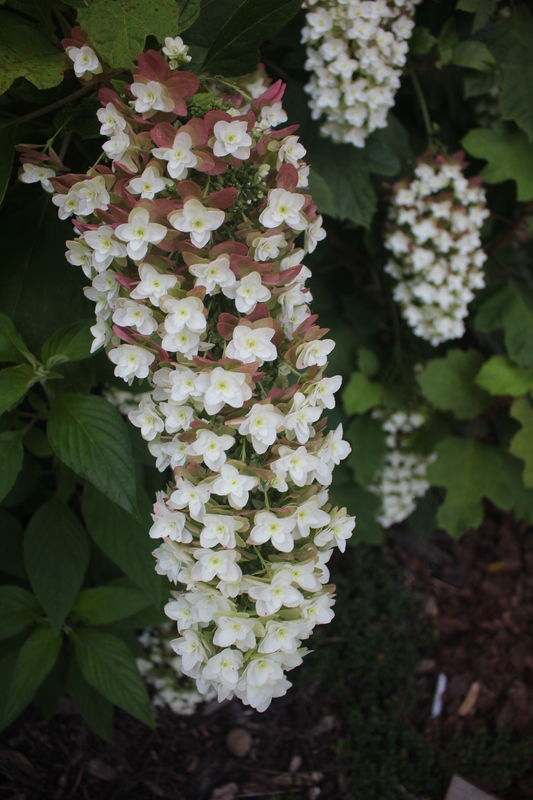 The blooms last to the end of summer where they have transformed from white, to purplish pink, to brown. It is adaptable and can be grown in full sun to afternoon sun, and boasts large dark green leaves that turn rusty red in the fall and are reminiscent of oak leaves. This plant blooms on old wood, meaning pruning must be done after flowering in late summer. As with most hydrangeas, supplemental watering during drought will keep it happy. Check in next week for smooth hydrangea and big leaf hydrangea! Hydrangeas have long had major appeal to gardeners and landscapers in the industry for their bigger than life ornamental appeal. This horticulturist planted two hydrangeas in the landscape within a few months of buying a house. Hydrangeas have what most horticulturists call multi season appeal and if you are a gardener with experience of dealing with fading daffodil and tulip foliage or the yellowing foliage of daylilies at the end of the season then you know what I am talking about. This growing season, I challenge homeowners to try their hand at growing one of the four beautiful hydrangea species that populates central Illinois gardens. 'Anablelle' grows three to five foot tall with large round white flowers that are 6 inches round and puts on a show for six to eight weeks. Anabelle will not tolerate full sun unless supplemental watering is provided. Hydrangea macrophylla is known as big leaf hydrangea. This hydrangea has a rounded mounded habit and asserts either pink blooms in basic soil or blue blooms in acidic soils. They are your litmus tests for soil pH. If consistent moisture is not being applied this species needs to be grown in partial shade. This species has two forms; lace caps or mopheads. The most common cultivars are Endless Summer, 'Nikko blue' and lacecap 'Twist and Shout.' It is best to prune after flowering. Sometimes even the best pruning practices can still leave you with out blooms as harsh Illinois winters can destroy stems; this is why it is best to give them somewhat o fa sheltered location. Endless summer blooms in July pink and white in Illinois alkaline soils. Endless summer has the unique ability to bloom on new wood and old wood making the bloom more reliable. 'Nikko Blue' reliant on soil pH for bloom colors but blooms in early June. 'Twist and shout' Abundant lacecap blooms all summer long, blooms on old and new wood and has red stems that boast red leaves during the fall months. making it unavailable to the plant. Lowering the pH by applying aluminum sulfate or sulfur can turn your hydrangeas blue. Sulfur is a safer bet when trying to lower pH as sulfur reduces the chance of aluminum toxicity that can occur from using aluminum sulfate.